We are now at the end of our Gourmet 50 Women Game Changers . Julie Powell is # 50. Thank you Mary, and my other fellow bloggers for allowing me to accompany you on this wonderful ride. Julie Powell is an American author best known for her book Julie and Julia. Powell was born and raised in Austin Texas. She attended Amherst College where she got a double major in Creative Writing and Theatre. She later married Eric Powell, an editor of Archeology Magazine. While working for the Lower Manhattan Development Corporation in 2002, Powell began a blog chronicling her attempt to cook all the recipes in Mastering the Art of French Cooking. The blog quickly took off and soon a book deal was made. In 2005 Julie and Julia was published. Powell’s second book was entitled Cleaving: A story of Marriage, Meat, and Obsession.This book deals with an affair she had after her first book was published. It goes into details how the affair affected her own marriage. It also has her as an apprentice in a butcher shop. Cleaving was published in 2009. A film adaptation of her Julie and Julia was released in 2009. She and her husband Eric Powell are still together. They live in Queens NY. I decided to make Roast Chicken. Massage the skin all over with the softened butter. Place breast side up in a roasting pan. In the lower middle rack of your oven. Twenty minutes later baste the chicken with the accumulated fat. baste again 30 minutes later place chicken on other side. Add the vegetables to the bottom of the pan. Open and close the oven door quickly while basting, as to not cool it down. Thirty minutes later lower the temp of your oven to 350. Flip the chicken back to breast side up. Allow to rest another 20 minutes before carving. Meanwhile make a delicious deglazing sauce to moisten each serving. Pour the juices into a saucepan, and deglaze the roasting pan with the wine. scraping the resulting liquid into the saucepan. Boil rapidly until liquid has reduced and thickened slightly, then whisk in the cream and continue to boiling until again lightly thickened. Correct seasonings and pass in a warm bowl with the chicken. The following bloggers are also featuring the recipes of Julie Powell today. I hope you’ll pay them all a visit. It is wonderful to see what they all have to bring to the table this one last time. It has been a joy to travel along on this culinary journey with you. We have learned so much. Nice crispy skin on your chicken–gorgeous. I’m sorry to see this journey come to and end..hope you’re going on to the next blogging adventure! I too am sad to see this journey end, although I will be starting from #1 and “catching up” on the 38 women I missed. 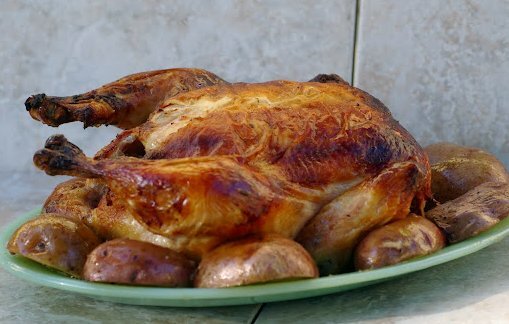 For me there is something about a roast chicken that says home like no other meal can. I love the sound of the deglazing sauce in your recipe and may just have to try it. Thanks for a beautiful post. This has been a fun and rewarding journey hasn’t it? It seems fitting that as we come full circle back to the beginning, you should choose to make the perfect back home meal! That chicken skin is the best kind of crisp! Lovely ending to a grand project. A perfect Sunday dinner and come-home-to-meal. It’s been fun, hasn’t it? There’s nothing more comforting than roast chicken, Veronica. Because I put some chicken in my salad every day for lunch, I roast chicken quite frequently. Great idea to put herbed butter under the skin! This series has been fun for all of us and given us not only the opportunity to meet game changer women we didn’t know about, but to meet each other and make friends! 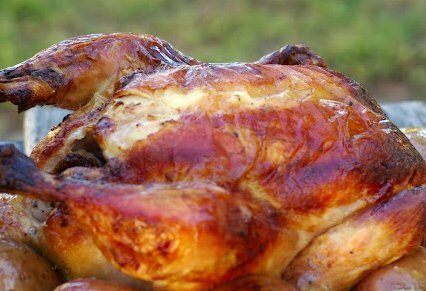 There’s nothing more delicious then a perfectly cooked chicken and this one looks amazing! Veronica, It’s been lovely getting to know you and I enjoyed the the journey! It’s been fun! Oh yes, great minds think alike! LOL, your chicken looks amazing – that skin! Wonderful way to close things out =). I have such issues trying to roast a whole chicken. I guess I am always afraid it won’t get done so I tend to overcook. Loved the book and I have learned so much from your posts about the game changers. One thing I’ve enjoyed about the blogging group are all the great roasted chicken recipes: Powell, Willan, Deen, and others. I’ll miss the group but I’ll still be checking in with you.